Despite the overarching instrumental designation of ‘violin(s) and continuo’ the instrumentation here is nothing if not varied. 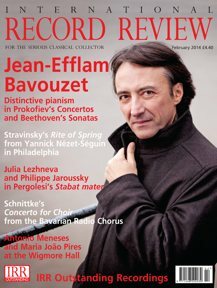 One is accustomed to hearing this music in a varied tonal palette — ‘continuo’ is a movable feast and there is plenty of historical justification for resourcefulness in the scoring of the accompaniments to seventeenth-century solo violin music. That said, it is unusual to hear quite this much resourcefulness, above all in the percussion department: the instrument list here gives Peter Kuhnsch’s arsenal as tar , Landknechtstrommel, tamburello, riq, darabuka and cymbal, although their participation is restricted to Schrnelzer’s ‘Fechtschule’ and Fux’s ‘Turcaria’ . (Their relevance to the latter seems reasonably clear; their relevance to the former less so. Perhaps we are to assume Schmelzer’s fencing academy to have a decoration along the lines of the appalling ceiling in the Salzburg Felsenreitschule, showing mannequins of vaguely Turkish appearance being used for decapitation practice.) There is also a dulcimer and Love Persson’s violone supplies a sonorous contrabass register almost throughout, whether bowed or plucked - it certainly dominates over the eight-foot register, which is not necessarily the only way to do things. Meret Lüthi’s performance is consistently excellent — her antecedents on disc in these works include Reinhard Goebel and Manfredo Kraemer and she easily withstands the daunting competition. I wondered how she might sound with a more familiar sonic support — it does seem a little capricious to have gone to the trouble of obtaining violins and a viola from Biber’s preferred maker Jacobus Stainer only to place them in such kaleidoscopic instrumental context that their particular tonal suitability for the music is to say the least difficult to ascertain. The Rare Fruits Council’s stupendous recording of the Harmonia artificiosa-ariosa managed to be scarcely less inventive in tonal palette (listeners may remember the unashamed use of the organ’s Zimbelstern) but rather more coherent in approach. While the performances by Lüthi and friends are excellent and their interpretative choices certainly musically and historically valid (albeit to varying degrees) , this collection impresses more as a catalogue of sonorities than as a coherent interpretative statement. 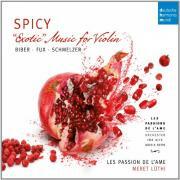 Spicy this music certainly is but for all the unexpected insights perhaps the seasoning is a little overwhelming.